Nasi lemak has always been a classic favourite among Singaporeans. But when Mdm Sarena Talib, 45, decided to give a fusion twist to this traditional dish in February earlier this year, she successfully boosted sales by 70 per cent. 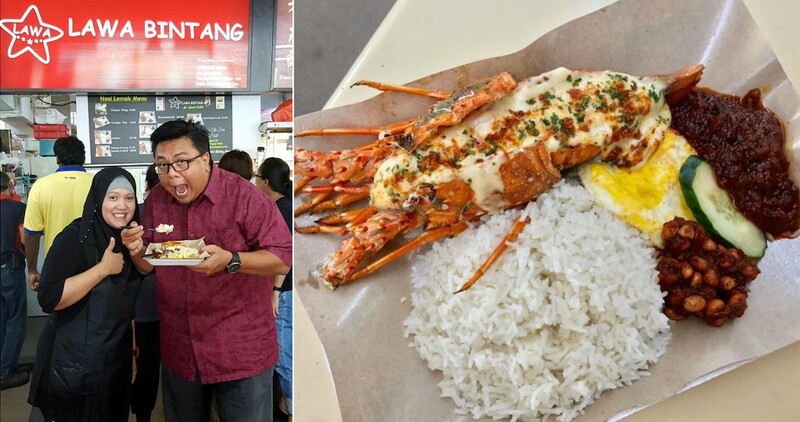 Despite the higher pricing (compared to their $3.50 regular nasi lemak), she received overwhelming response from Singaporeans, a testament that the addition of grilled seafood is a winning recipe. According to Mdm Sarena, she got the idea from the brisk sales of the seafood stall next to hers. “The variety of food sold at the stall is not cheap, but it still draws huge crowds during lunchtime. This was when I decided to match the luxury ingredient to the traditional food,” she said. The former property agent started running Lawa Bintang Nasi Lemak with her husband about two years ago. She decided to make a job switch when the property market slowed down about for years ago. It was a natural progression for her to delve into the food industry since her mother also runs her own nasi padang stall at Bedok North for about 40 years now. Following her mum’s footstep to be a hawkerpreneur, she started off selling nasi ambeng. And only in recent years did she decide to specialise in nasi lemak with Lawa Bintang Nasi Lemak. Their stall, which was previously located in Tai Seng and Kaki Bukit, is now housed in the Tampines industrial area. Despite its ‘ulu’ (remote) location, the stall has been drawing huge crowds everyday thanks to its newfangled fusion nasi lemak. “Nasi lemak is something well-known in Singapore. It is a meal that can be eaten at any time of the day – for breakfast, lunch, dinner, and even supper,” said Mdm Sarena. She added that the younger generation is also more open and receptive to new food offerings, which encouraged her to take the leap and experiment with the traditional dish. 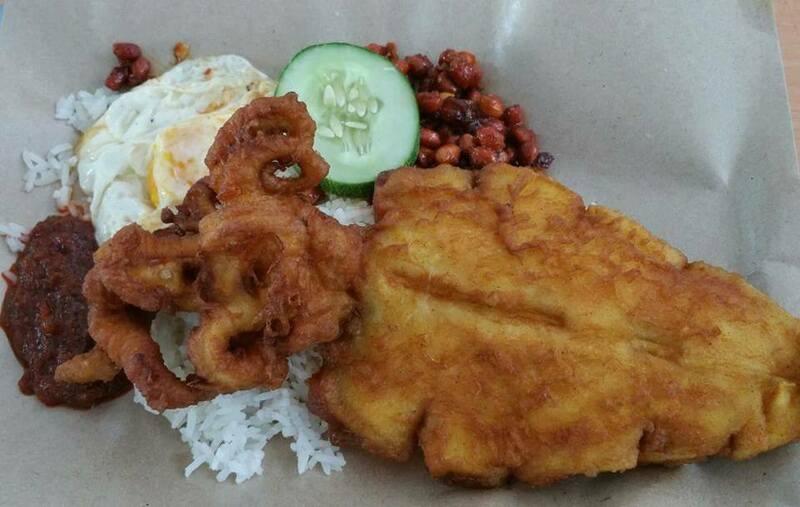 The first fusion dish they introduced was the Nasi Lemak Sotong King (Big Squid). 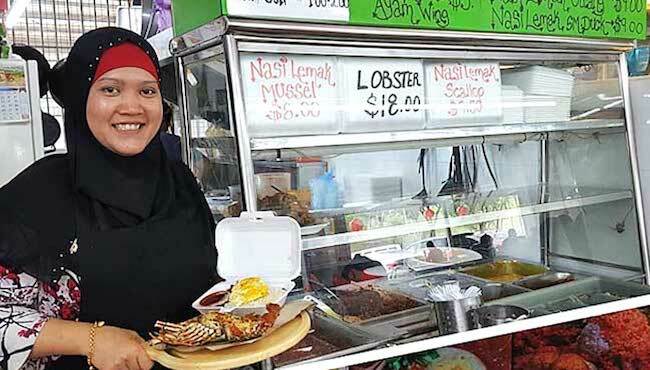 Motivated by the good response, Mdm Sarena started adding more fusion dishes to her nasi lemak menu, including lobster, cray fish, salmon, and softshell crab. Originally, Mdm Sarena thought of just offering grilled lobsters; but her nephew, who is a chef, suggested to add cheese to the lobsters. It turned out to be a huge hit, and the Lobster Nasi Lemak remains to be their best-selling dish, with up to 30 plates sold daily. The dish is served with a whole lobster filled with three types of cheeses, seasoned with ground herbs and comes with the usual nasi lemak condiments – fried egg, sambal peanuts, anchovies and sambal chilli. The only catch? It’s $22 price tag. Some might think that it’s exorbitant to pay such a price for a nasi lemak, but considering that lobsters are sold at a much higher price elsewhere, $22 is actually pretty affordable. As freshness of their ingredients is important, the couple made it a point to have fresh seafood supply delivered to their stall every morning. With these fresh seafood ingredients, it’s definitely a step up from the regular nasi lemak. Beyond the seafood pairing, Mdm Sarena emphasised that the rice and sambal is what make or break the Nasi Lemak. In fact, Mdm Sarena revealed that her homemade sambal chilli takes about 5 hours to cook. When Singaporeans caught wind of Mdm Sarena’s nasi lemak fusion thanks to the various media coverage, her stall received a lot of hype and attention. A long line forms every morning – with a wait of up to two hours – by people waiting to try the latest nasi lemak sensation. To diffuse the long wait, Mdm Sarena even implemented an ordering limit per customers. “We had one customer order five lobsters (at once) and the people behind didn’t have a chance to get it. 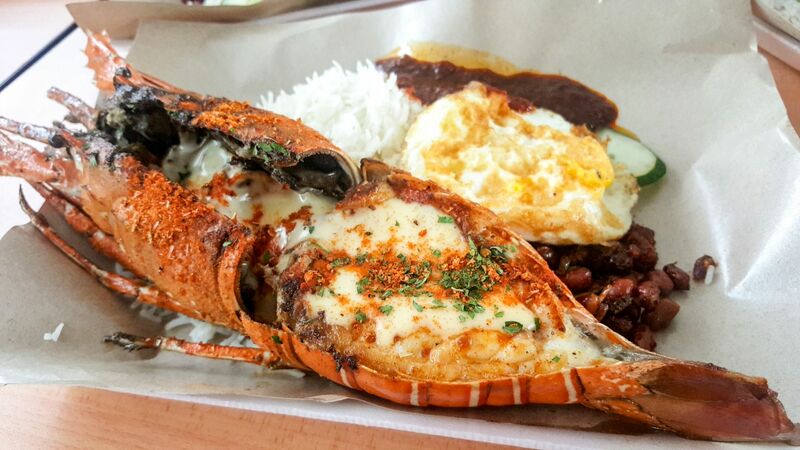 So we set a rule that one person can only order two lobster nasi lemak,” she said in a separate interview. Right now, Mdm Sarena said that they still enjoy large crowds at the stall, but customers come at various timings throughout the morning and afternoon. Adding to this, she said that they have grown accustomed to serving faster to cope with the huge demand, so as to keep their customers happy. “We don’t want to keep their grumbling tummies waiting!” she said with a laugh. If you want to grab a plate of her raved nasi lemak, be sure to come early as her stall closes at 2pm! Justifying her early closing hours, Mdm Sarena said that she wants to focus on serving the breakfast and lunch crowd. It proved to be a good call anyway, because her menu is typically sold out by 1 or 2pm. 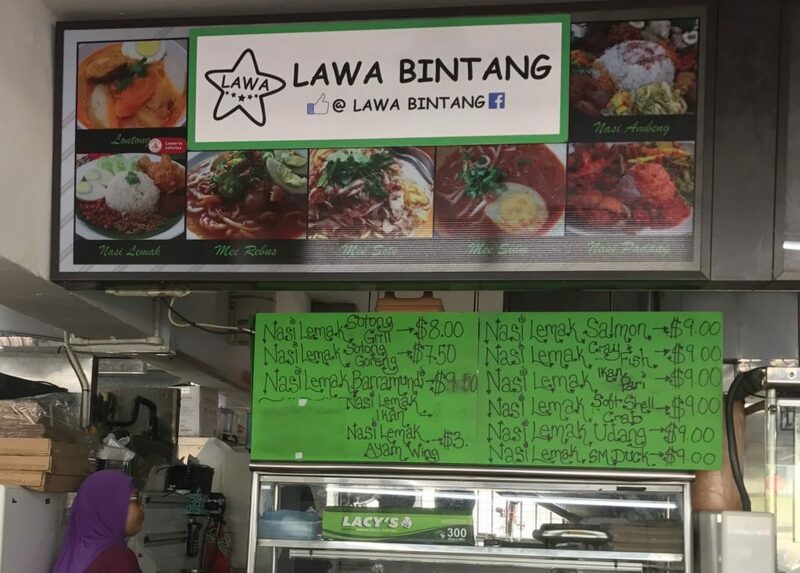 Lawa Bintang Nasi Lemak is located at Blk 9008 Tampines Street 93. Opening hours: 8am to 2pm (Tuesdays to Thursdays), 10am to 2pm (Fridays), 9am to 2pm (weekends). Closed on Mondays.